Wow what a week! Unfortunately because of buying and selling a house and getting ready for a big trip I have not had the time to make cards this week. Hopefully I will this weekend. We will be celebrating my Dad's 76th birthday on our trip and I have been instructed to make multiple birthday cards and a banner for his suite. 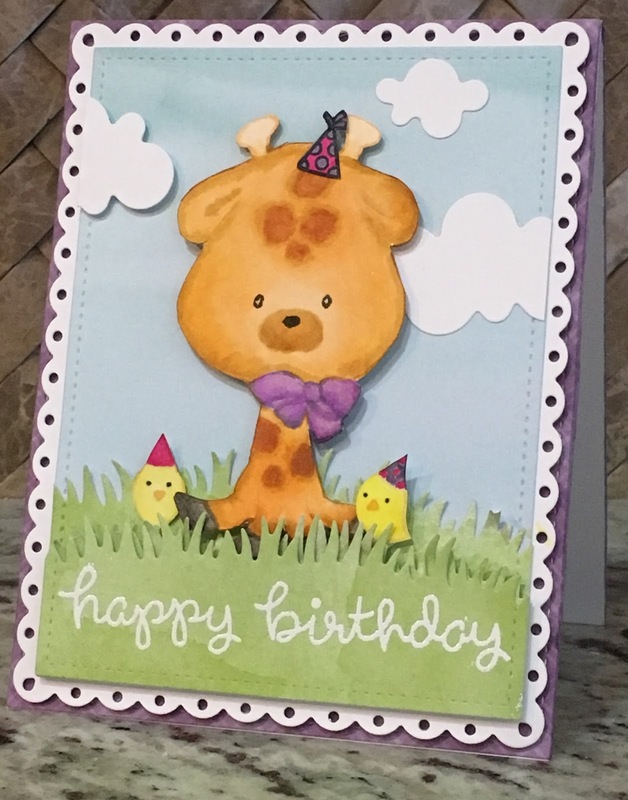 My little niece loved her giraffe and card last week. Here is a video of her opening her gift. The reaction is completely priceless. If you didn't get a chance to see that post CLICK HERE to check it out. Please note: This video requires Flash player which may not be on all devices. This gift was such a win-win. I loved giving it, she loved receiving it and WWF gets to continue their works saving our wildlife. It's a beautiful thing. * Please be sure to go to your email and validate your registration. Only validated subscribers can be entered into the drawings. Drawings are open to everyone no matter what country you are in. Please be aware that if you live outside of the United States you will need to pay a small postage fee for the delivery of your prize. G'day to y'all from this Aussie in Texas. This post is a stop on the super fun and inspiring Charity Blog Hop. Be sure to check the other blog stops listed below (and here) for other great charity gift ideas and projects to go with them. 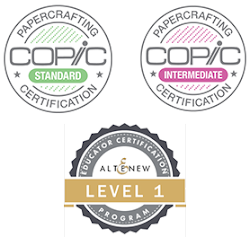 Awesome companies are helping inspire you to hop along and leave comments on all the blogs - Altenew ($30), Lawn Fawn ($50), My Favorite Things ($25), and Ellen Hutson ($25)! Be sure to go say thanks to them on their social media sites for helping get the word out about giving … and leave comments by Wednesday, March 22, 2017. Winners will be announced on Sandy’s blog on Thursday, March 23, 2017, along with the total amount we’ve raised together! When I heard about this Hop, I was so excited and instantly knew exactly how I wanted to participate. I have a little niece, Mila, who turned two on March 4th. She is a huge giraffe fan and I had to make sure she adopted one of her very own. I chose World Wildlife Fund as my adoption agency as I have done many times over the years. They have different donation levels to fit any budget and the money goes to help conservation efforts around the world. There are many animals to choose from as well, making it a great gift for almost any animal lover on your gift list. 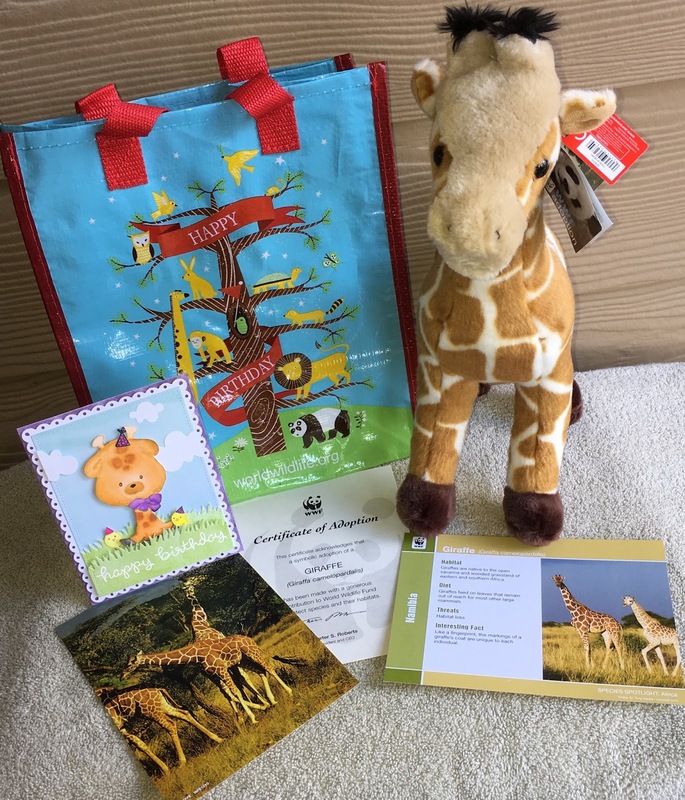 I chose the animal/level that included an adorable stuffed giraffe, along with an adoption certificate, photo, and fact card, pictured above. The package also included the adorable reusable gift bag so the gift was all taken care of except for a card. And that's perfect for a card maker like me since, of course, I want to make my own card for my niece. That's how this little cutie came to be. one purple plaid piece from Perfectly Plaid Rainbow Petite Paper pad for mat. To create a no-line color technique, I stamped the image lightly in Distress Antique Linen Ink. This is a lovely light color that blends beautifully with many colors, fading away to create the illusion that it is not a stamped image. I then proceeded to color the giraffe with the Copic colors listed in the supplies below. I colored the head first, covering it with a good coat of YR20. I then colored the areas I wanted shaded with YR23 and blended it all out with the YR21. I went slowly and repeated the process until I was happy with the result. 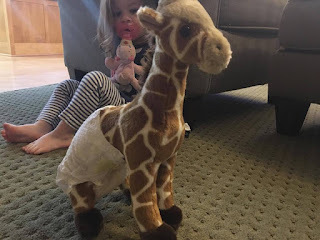 I used the YR27 for the giraffe's spots and the YR20 for her ossicones (horns). I colored the hooves in various warm gray colors and the bow in violet. My niece, like her mom, is a big fan of purple. My coloring was completed with the little chick partygoers (Party Animal Stamp set from Lawn Fawn). They came to life with a couple of yellows and an almost orange for their beaks, as well as magenta and violet for all of the party hats. 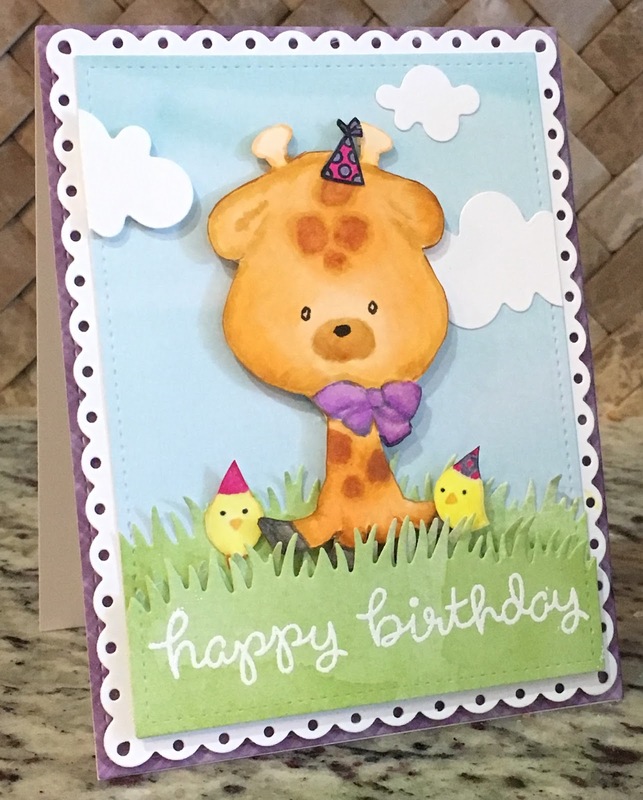 I set the scene for the card by using a variety of dies and a petite paper pack from Lawn Fawn, one of my favorite companies. Purple layer -- Largest die from the Large Stitched Rectangles dies. Scalloped layer -- Largest die from Fancy Stitched Rectangle dies. Blue and green layers -- Largest die from the Small Stitched Rectangle dies. Green layer -- Cut a Grassy Hillside border from each end of the Small Stitched Rectangle. Attach the tallest one to the blue layer. 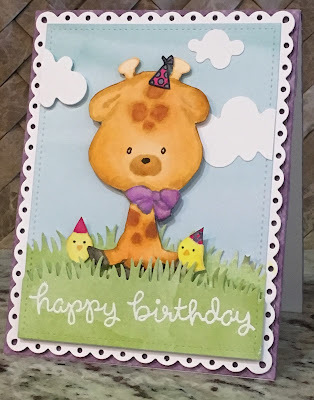 Stamp Happy Birthday from the Party Animals Stamp set in white onto the shorter grass piece. Sprinkle with embossing powder. Heat set. Pop grass up on the front of the card with Scotch Foam tape. Cut three clouds out of some scrap white cardstock and, for some added dimension, pop one of the clouds up with Scotch Foam tape. I also popped up the chicks and the giraffe with Scotch Foam tape. What can I say, I love dimension! 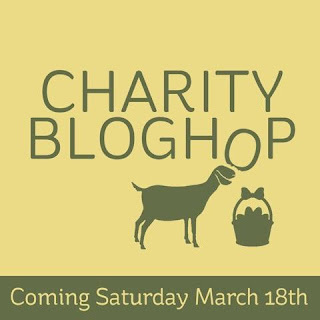 Thank you all for visiting me today and participating in the Charity Blog Hop. 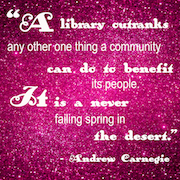 :) Please be sure to subscribe to my blog for weekly giveaways and remember to hop along and learn about all of these wonderful charities. Next up is Melissa Miller and here is a complete list for your hopping pleasure . I hope it inspires you next time you have an occasion to give a gift. It's been a busy week. We have sold our home and our new home is getting close to being done so no card today. I am also preparing for a very special event coming later this week. Keep posted for more information on this very special bloghop that is guaranteed to inspire us all. CONGRATULATIONS TO: Brenda Lilley of Texas. It's a question I am often faced with. Do I Copic or do I Zig? They are both wonderful mediums with which to color. When I get a stamp set like this beautiful Kind Soul set from Wplus9 I can normally choose one or the other but in this case I opted to Copic color one and do some cheerful no line watercoloring with the Zigs on another. I was so excited to finally have the time and the inspiration to participate in The Daily Markers 30 day color challenge. The process for both cards is quite straightforward. 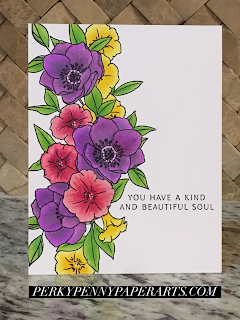 I colored the Copic card using 3 colors for each flower. I started by coloring the whole flower in the lightest color. Then I used the flicking technique to create some depth and dimension from the middle, darker parts of the flower outward. I accented the centers of the flowers with my Uni-Ball Signo White Pen. I used two colors of green to color each of the leaves and finished by stamping the sentiment that is included with the set in Onyx Black Versafine Ink. I started the Zig card by stamping the image with Antique Linen Distress Ink. It's a nice light shade that is easily covered up by the bold, beautiful Zig colors I chose to color these flowers. 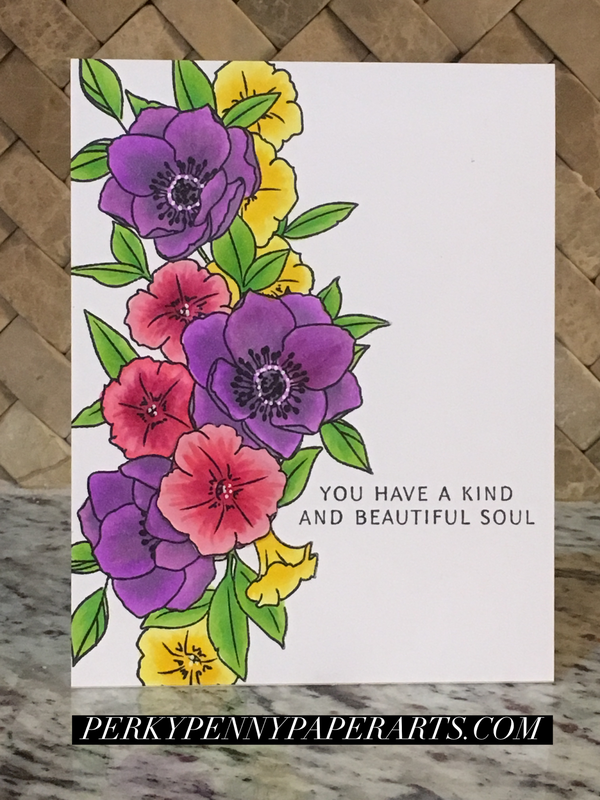 With the Zig coloring I drew around the outline with a very thin line of the Zig marker color and then flicked in some color in the areas of the flower that I wanted to appear darker. I blended the color out with my favorite watercolor brush dipped in water. The real trick to no line watercolor is to never color 2 petals next to each other at the same time. I would color a petal and then skip a petal and so on so that the colors would have plenty of time to dry. This ensures that the colors don't run together. After the petals were all colored and completely dry I added accents with the same marker except this time I did not blend them out with a wet brush. I then let this dry before adding some white accents with the Uni-ball Signo White Pen. I didn't want this second card to look too much like that first card so I decided to fussy cut the right edge of the image to place it on an embossed background. I used the We R Memory Keepers Next Level Woven embossing folder, an absolute fave, to create said background. Nothing fancy here I just attached the colored image onto the front of the embossed cardstock. Please check below for a list of supplies used in today's cards. This should typically be a Friday post but we got an offer on our house yesterday and were wrapped up in dealing with that. So excited to not have to show the house anymore. Now we can look forward to our new home. Yay! Please refer to this LINK to read the rules for participating in our weekly giveaway. This week's prize will have the lucky winner hopping to make adorable Easter cards. 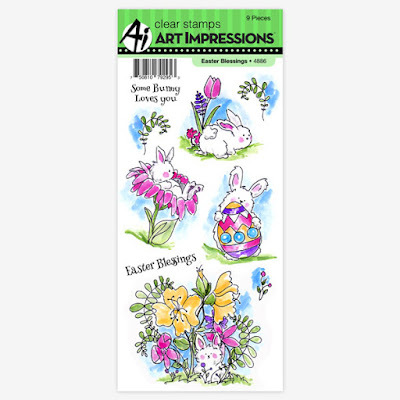 The Easter Blessings set from Art Impressions includes four adorable mischievous bunnies guaranteed to make anyone smile. When a new Lawn Fawn release comes out I do a happy dance. February's release was no exception and they had a stamp set to go with my feelings. I die cut the Rainbow Plaid background with the largest stitched Rectangle from the Lawn Fawn Stitched Rectangles and the scalloped die from My Favorite Things Blueprints #1. I used the brand new Happy Happy Happy Stamps and Dies from Lawn Fawn to create the sentiment. I die cut 5 blanks of the bold Happy and glued them together to pop up the word. 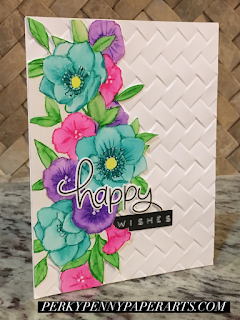 I was very busy last week as I mentioned in my last post so stamping and die cutting the flowers from Lawn Fawn's new Fab Flowers Stamps and Dies was a great way to relax and get some crafting in. When I had some time available everything was ready to start making some cute cards with these pretty florals. Check out my last blog post for the color combinations I used to make the flowers, butterflies and leaves. I popped up the flowers with some foam tape to add to the dimension I created with the popped up Happy. I finished the card off by selecting some coordinating copic markers and coloring in the bold, popped up happy. It created just the contrast I needed to complete the look. Congratulations to Lynn Antle :). She is the winner of the Summer Bloom Stamp set from wPlus9.